The directorship of Dr Strong, as he was then, was the National Portrait Gallery’s finest hour. A virtual storage facility was suddenly transformed, with the Doctor seen off-duty in velvet and ruffles, the art world’s fifth Beatle. A. S. Byatt described him at this time as ‘an icono-grapher, possibly even an idolater, of the Virgin Queen’, and one of his first acts as our youngest-ever director of a national gallery was to get his favourite picture cleaned, thus affording him ‘the thrill of seeing the great full-length of Gloriana, the ‘Ditchley Portrait’, stripped of crude overpaint’. ‘Ditchley’ because the picture’s first mention is in 1718 at the Elizabethan house of that name. It was built in 1592 by Sir Henry Lee, for many years the Queen’s Champion at the ceremonial tilts or jousting tournaments. The tilts were of considerable ritualistic import-ance (Royal Ascot a faint echo), with the tournaments and the queen’s portraits growing in splendour with her achievements. 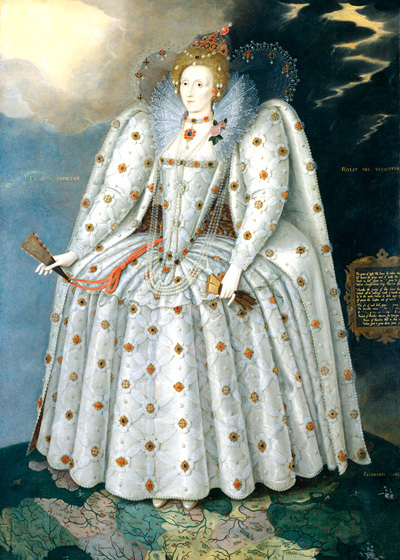 The 1590 tilt was of special significance, the first since the defeat of the Spanish Armada, and the portrait, probably commissioned by Lee, who retired that year, commemorates it. Elizabeth, in her magnificent jewelled dress, bestrides the globe, her all-conquering power even banishing the storm. The world shown is mostly southern England, her feet neatly planted on Oxonium (Oxford), Ditchley’s county. Elizabeth never ventured north of the Trent or west of the Severn, but she did inaugurate Ditchley. During the festivities, she acted the Fairy Queen, ‘discovering’ Sir Henry ‘slumbering’ in an enchanted grove. They were both nearly 60.